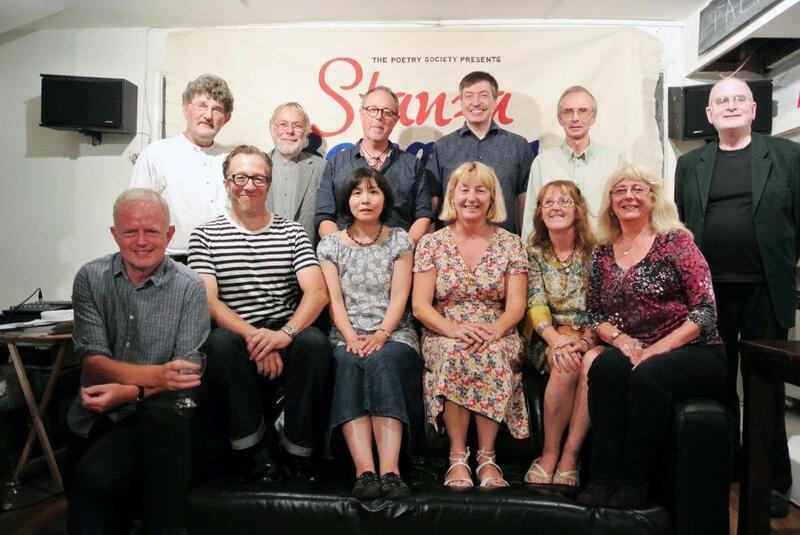 On August 6, the Enfield Poets stanza group made their debut appearance at the Poetry Cafe in London’s Covent Garden, where they read alongside the North Herts Stanza Group. It was, by all accounts, a very hot, but hugely enjoyable evening, with an enthusastic audience enjoying some fine poetry from both groups. The Enfield Poets are: Anthony Fisher (second from left, back row), Chris Hamilton (5th from left, back row), Terry Jones (1st left, front row), Jayne Buckland (4th from left, front row), Mary Duggan (5th from left, front row), and Annmarie Nicholson (6th from left, front row. All gave a very good account of themselves and we are looking forward to hearing them perform again at Enfield Poets in November (see ‘Readings’ page). A romantic candlelit flicker to a musical and poetical evening in a full house was thoroughly enjoyed. Alan Murray’s inspirational treament of the life, times and poetry of John Donne was riveting. His exploration of Donne’s life decisions and deep love for Anne More made the metaphysical poet more accessible to this curious audience and was done with a subtle theatricality that is so very Alan Murray. So popular was the response that a continual need for extra seats was called. The wonderful dulcet tones of descant and treble recorders and bassoon added to the rich Elizabethan ambience in Forty Hall’s rustic barn. All mirrored perfectly the Elizabethan artifacts and styled walled garden of Forty Hall. As a child I would run my fingers across the Elizabethan furniture on display.I absolutely loved the evening so a huge thank you Alan for drawing us back in time! Yet again a ‘Murray’ contingent, turned up for the packed evening of skilled diverse readings at Lauderdale House, Waterlow Park, Highgate on Wednesday 22nd April. Extra chairs called for, the wine was good but the poetry so much better! Housed in the particularly sympathetic Lauderdale House my ears were buzzing from the variety of poetical voices. Alan, in his inimitable nonchalant style drew on the spectre of the very dour ‘Harry’. The subject of small psychodramas that in their short- bursts had us chortling! Some beautiful pieces of the total ensemble made this evening a delightful blend. And a well presented friendly event.